Christ is shown crucified, flanked by the two crucified thieves. Longinus approaches on his horse from the left, his spear lifted to pierce Christ's side. Mary Magdalene sits at the foot of the cross watching Longinus, her pot of ointment on the ground near a skull. To the right St John supports Mary. In the background is a city under a lowering sky. 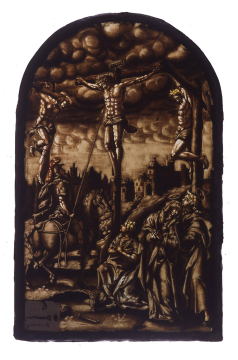 The panel is after Marten de Vos, Christ on the Cross, Longinus approaching with his lance. The original drawing is dated 1582, and the engraving is in the same direction. The panel is a very close copy, including all major figures and background buildings but omitting some small figures in front of the distant buildings. Popham suggested ‘Heemskerck, 1600’. Although the source is Netherlandish the monochromatic paint and painting style are close to the German panel Saint Judasius, SG73. There is a replica in Merton College Library, Oxford, and a variant, omitting the two robbers, in a private collection in Northamptonshire. Berserik has pointed out another replica in the Rijksmuseum, Amsterdam.